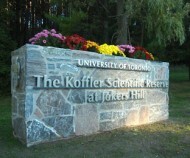 KING – Koffler Scientific Reserve at Jokers Hill – toward a sustainable future through research and education on the environment, in the environment. Located on the Oak Ridges Moraine in King Township, north of Toronto, the Koffler Scientific Reserve at Jokers Hill is an internationally recognized site for cutting-edge research and education in biodiversity, ecology and conservation biology. Its origin dates to 1995, when Drs. Murray and Marvelle Koffler donated their 350-hectare equestrian estate, Jokers Hill, to the University of Toronto. The gift made the University one of the largest landowners on the Moraine—and steward of a site of regional, provincial and national significance. Most of Jokers Hill is blanketed by a mosaic of wetlands and forests, including Ontario’s largest remaining stand of old-growth hardwood. In this Ecological Observatory, scientists monitor, measure and analyze natural processes as they unfold. The hayfield and pastures–relics of the equestrian days–are an Ecological Laboratory where researchers perform intensively manipulative experiments that subject theories about the environment to scientifically rigorous testing. Course from the University of Toronto bring students to Koffler Scientific Reserve for the type of hands on experience in natural environments that no campus can offer. Learning is life long. Koffler Scientific Reserve offers instructive and entertaining learning experiences through special events, including informal guided Nature Walks and more intensive Natural History Workshops. A system of public walking trails, on the eastern end of Jokers Hill, offers an opportunity to experience an important piece of Ontario’s natural heritage. Please note that all users of the Koffler Scientific Reserve Public Trails do so at their own risk, and that the Reserve is not responsible for any problems that may occur on our trails. The most significant conservation measure ever taken at Jokers Hill was when General Mann, one of its first owners, sent bulldozers through the forest! Those bulldozers created a network of bridle trails that soon attracted the equestrian community, who in turn, made Jokers Hill a vibrant centre able to resist the pressures of development during the post-World War II building boom. The horses are gone, but many of the trails remain. Thanks to efforts of our partners, the Oak Ridges Trail Association, York Region and King Township, the University of Toronto can open several routes on the Reserve’s eastern end for public enjoyment. Public trails can be accessed from two points. The main public access is through the Bathurst Street entrance (between Highway 9 and Mullock Drive). Take the first turn-in on the west side of Bathurst, just north of Keith Avenue, Newmarket. The Blue Trail can also be reached through the Thornton-Bales Conservation Area, on the 19th Sideroad (Mullock Drive), King Township. Trails are open for use starting one hour after sunrise and ending one hour before sundown. Night use is strictly prohibited and violators are subject to arrest for trespassing.